Andrea Rahal at Inkwell Boutique. Photo by Michelle Doucette. As we launch Swell Made Co., we're going to start featuring the stockists who carry our paper goods. 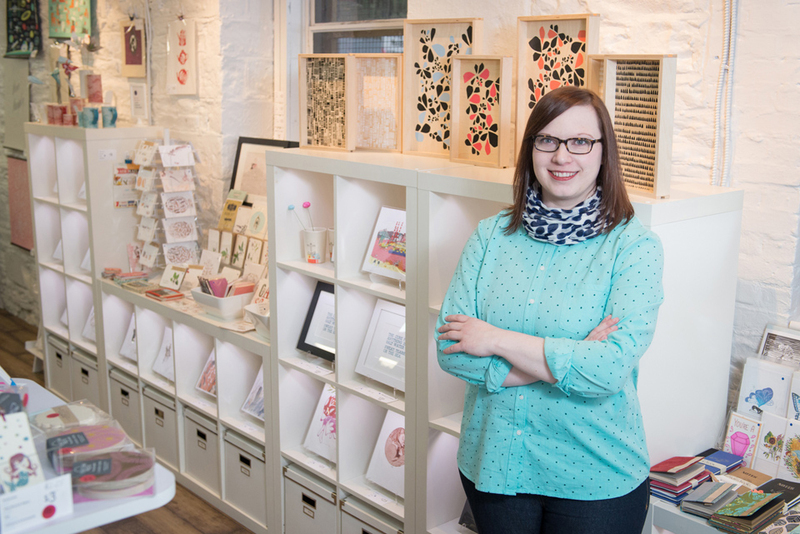 We're thrilled to announce, Inkwell Boutique Modern Handmade Boutique & Letterpress Studio in beautiful Halifax, Nova Scotia is our first stockist! Andrea Rahal owns and operates her boutique in a trendy little area of Downtown Halifax. Inkwell Boutique offers a vast array of paper goods, home goods, jewelry and art - much of it, locally made. Her collections are thoughtfully curated and are all unique. As soon as you step through the door, you just know it will be a fun visit. It's whimsical, modern and elegant. In addition to running the shop, Andrea also offers design services specializing in custom work that is destined for letterpress at Inkwell Press. She runs her studio in the back of her shop. It's a perfect marriage of art and entrepreneurship! It's quite fitting that Inkwell is our first Stockist. Lesley and her husband spent some time living on the east coast a few years back. Their first child was born in Moncton, New Brunswick! So, a piece of their heart always remains on the east coast. Even though it was brief, their time out east was life-altering and heart warming. The landscapes are breathtaking and the people are truly the kindest, most generous you'll find (they throw great kitchen parties to boot!). That's not to say they were never homesick though. They often made trips to Halifax and always felt very much at home. Inkwell Boutique was one of their many, many favourite stops in Halifax. There are too many to name, but if you're curious we're happy to share! If you're in Halifax, please say a warm hello when you visit Andrea and her sweet shop! Purveyor of modern handmade paper goods and other goodies for your home. All handmade with love, by artists from around the corner and across the world. We also offer custom letterpress printed personal stationery.